When faced with the task of cleaning a surface full of debris, dust, grease, oil, marks, or other stains, it is foolhardy to try and do it yourself, armed with just a mop and bucket. 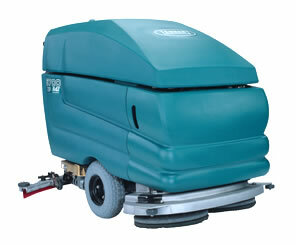 Auto scrubbers or automatic floor scrubbers can do the task more efficiently, more quickly and more easily. Not to mention, these machines are hygienic, so they require less water, and pose fewer risks of slips or falls for the user. Automatic floor scrubbing machines have either a disk or a cylindrical scrubbing head and they use inexpensive pads or brushes to wash or strip the surface of dust and wax. Floor scrubbers with a cylindrical scrub brush are heavy duty in nature, with up to three times the speed of a disk brush. Such scrubbers also wet sweep the solid debris, doing away with the need to pre sweep the surface. Newer types of small blade and agile scrubbers may be required to reach edges and corners where larger machines cannot. Regardless of the type or size though, floor scrubbers have automated systems to dispense cleaning solution to the surface, and then vacuum it up. All the user needs to do is pass the machine over the surface and press the button. The machine dispenses the liquid, scrubs the floor, and then vacuums the residue to a separate recovery tank. Without an automatic floor scrubbing machine, your floors will be dirtier, your employees will run a higher risk of injury, and you will spend more money on wasted water and cleaning solutions. Automatic floor scrubbing machines regulate all of these things to ensure your floors are as clean as they can be and your money is not being flushed down the drain with wasted water.